“If we try to carry him, he winces in pain. He can only lie down in my lap. If he is crying so much from a small touch, I wonder how much pain he will be going through when they put needles in him. 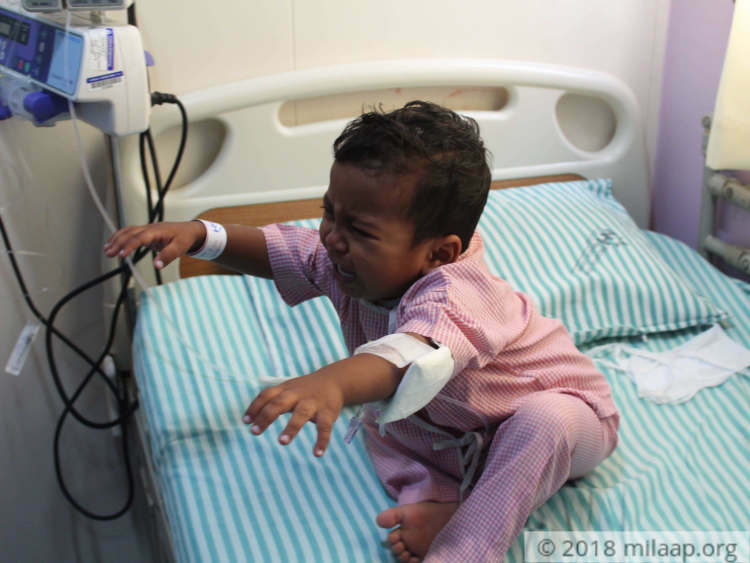 He points at the hospital door and cries; he wants to go out. 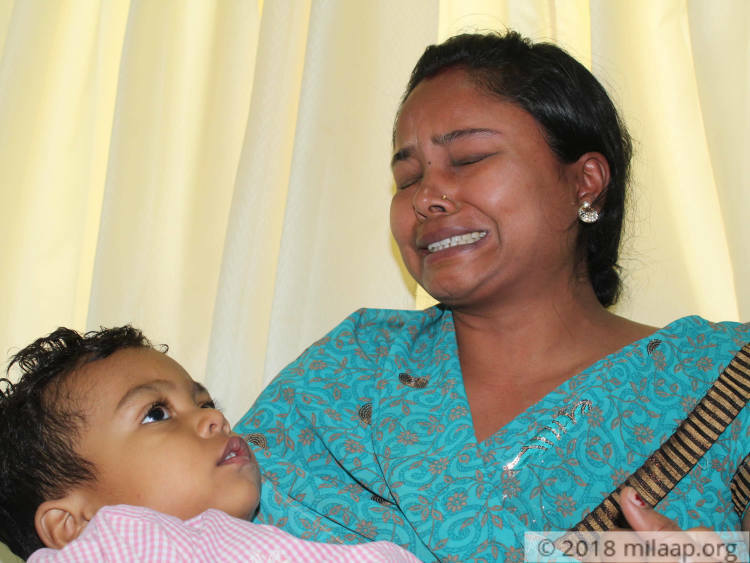 I wish God gave his pain to me.”-Sabitha, mother. 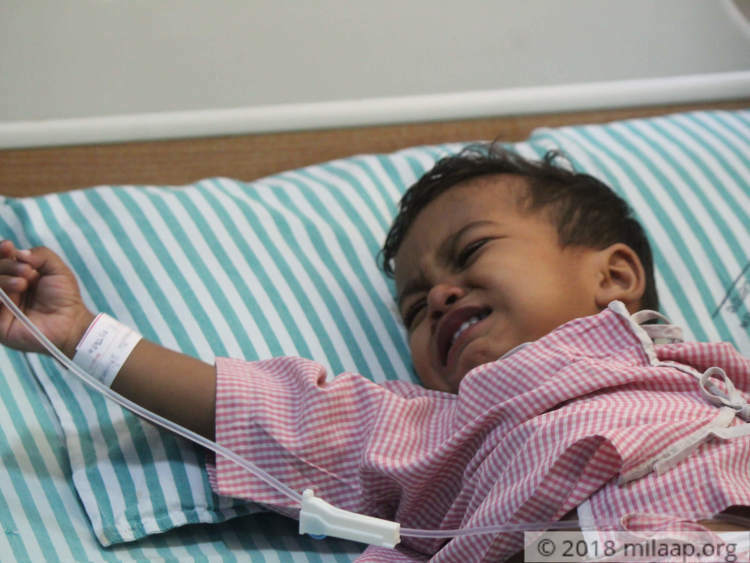 2-year-old Shivansh has not started speaking in complete sentences yet but his parents know that he is going through hell by the look on his face. He also whimpers and sobs to his parents Chintu Kumar and Sabitha every now and then. Shivansh has acute blood cancer that can kill him without urgent treatment. They are running out of money, but cannot watch their child suffer and all they can do is hope for a miracle. That morning Shivansh was playing with his 5-year-old sister Samikha. But by night, he became weak and was running a very high fever. This went on for a few days. Slowly, he started getting small red spots everywhere below his waist. “The spots were on his legs, thigh and everywhere. He was always crying so much. I couldn’t console him at all. Doctors in our hometown of Hosur couldn’t understand what his issue was.”-Chintu Kumar, father. The fever lasted more than a week and Shivansh had become so weak. Chintu Kumar and Sabitha started becoming worried day after day because they had not encountered such an issue with their child before. 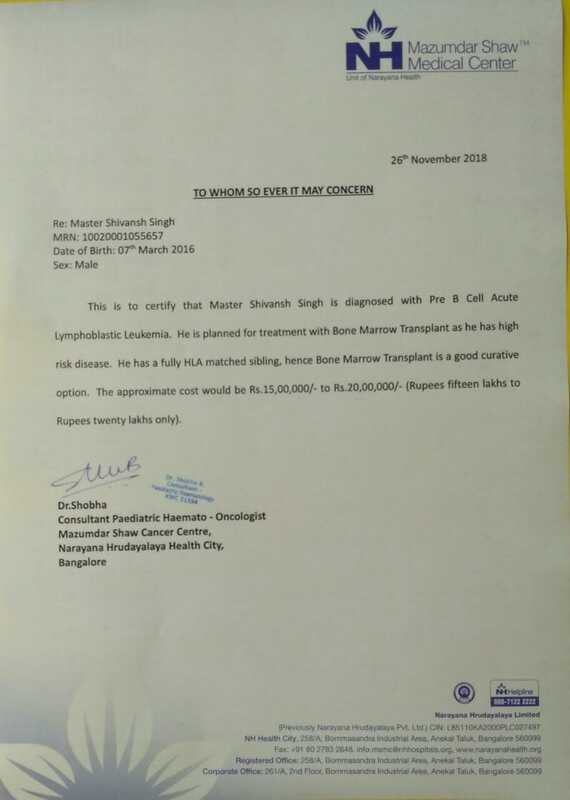 They rushed him to Bengaluru soon because something did not feel right. “My son had completely changed. He was not himself at all – his playfulness and naughtiness had completely vanished. When the doctors told us he had blood cancer, I broke down. I started feeling sick too. 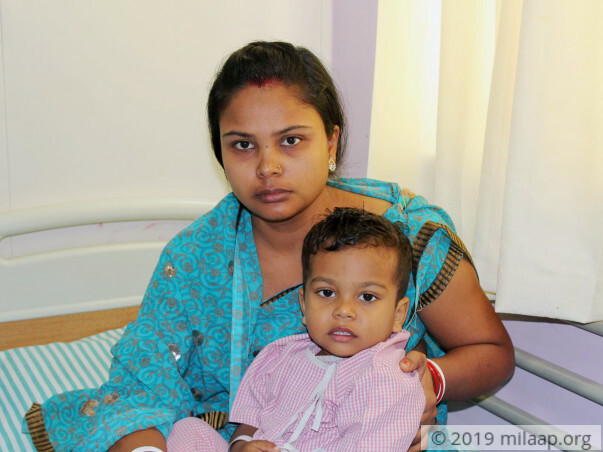 I couldn’t eat for days afterwards – he has hardly started his life and he is already suffering from this dreadful disease.”-Sabitha, with tears in her eyes. 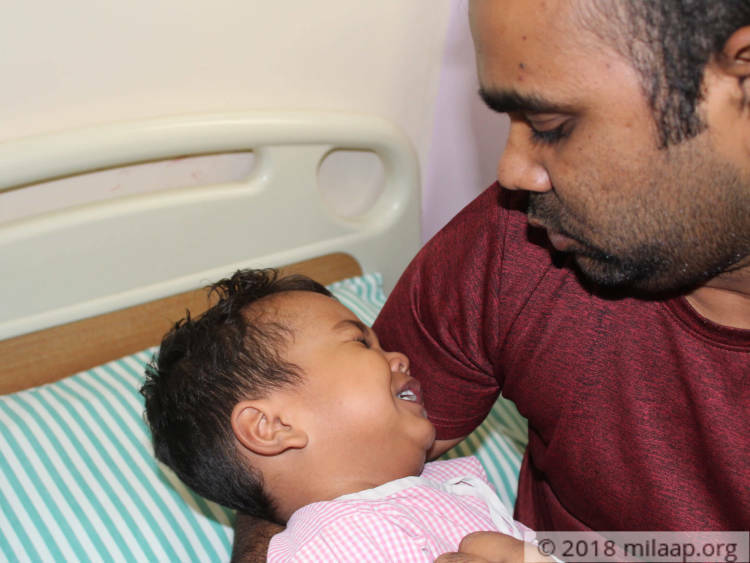 “The other day he cried so much when they were inserting the chemo port in his chest as they were not able to find a vein elsewhere. He was screaming in pain. But when I tried to hold him, he made whimpering sounds. He was showing me his hand and back. I think that’s where it hurts the most for him.”-Sabitha. 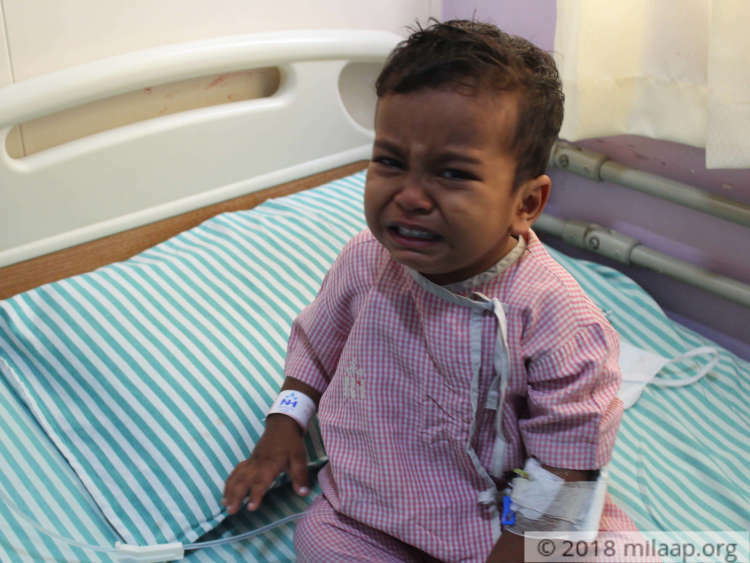 Ever since his treatment started two weeks back, Shivansh’s appetite has been growing. He keeps signaling to his mother that he wants more food, but she does not give him. His parents feel so broken seeing their child cry for food. “We are happy to starve for our child, in fact we want to be able to feed him till his stomach is full. But the doctors have strictly told us not to. Shivansh is already going through so much, so he gets very irritable when we deny food.”-Chintu Kumar. Chintu Kumar had to leave work mid-way to take his wife and son to Bengaluru. He only had a few hundred rupee notes in his pocket at that time. He somehow managed to ask his friends and co-workers for money after learning that Shivansh had cancer. “I have managed to pay Rs 1 lakh at the hospital – all borrowed money only. After asking so many times, I was only able to gather this small amount. I don’t know how I will afford the rest of Shivansh’s treatment. My wife is also getting sick from all the stress, because she had to leave our 5-year-old back in Hosur with her grandmother. I am just holding on for the sake of my baby.”-Chintu Kumar. 2-year-old Shivansh needs prolonged chemotherapy to beat cancer. 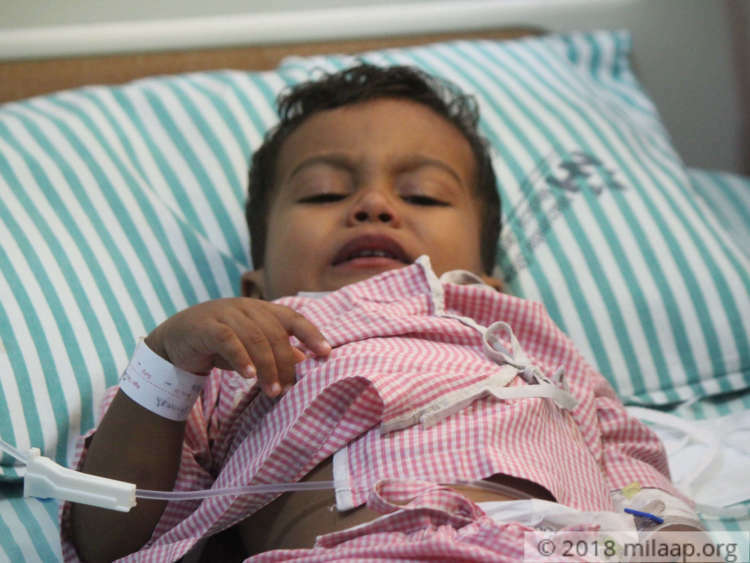 He will not survive without immediate treatment but his poor parents have nothing to save him. His mother does not even have any jewelry that she can sell urgently. The family was living happily on Chintu Kumar’s modest income before Shivansh’s diagnosis. Here is an update on Shivansh. He has been admitted to the hospital. 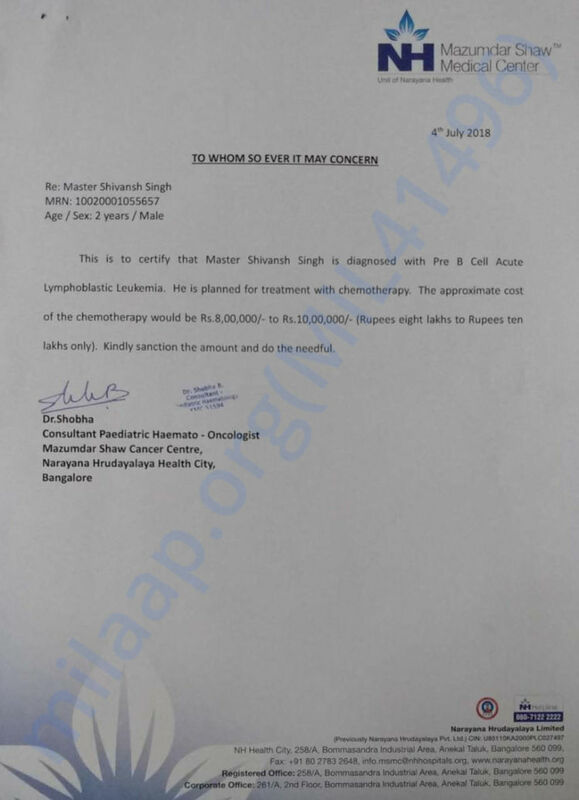 We are re-starting the campaign as he needs more funds to undergo Bone Marrow Transplant. Hence increasing the target amount. Here is an update on Shivansh. He has been admitted to the hospital on the 16th of November. He is still in the hospital. Chemotherapy is going on. He might need a BMT , but that depends on his test results. Will keep you posted. Than you for your love and support. Here's an quick update on Shivansh. He has Completed consolidation chemotherapy. He is waiting for his reports, after which the course of action will be decided.